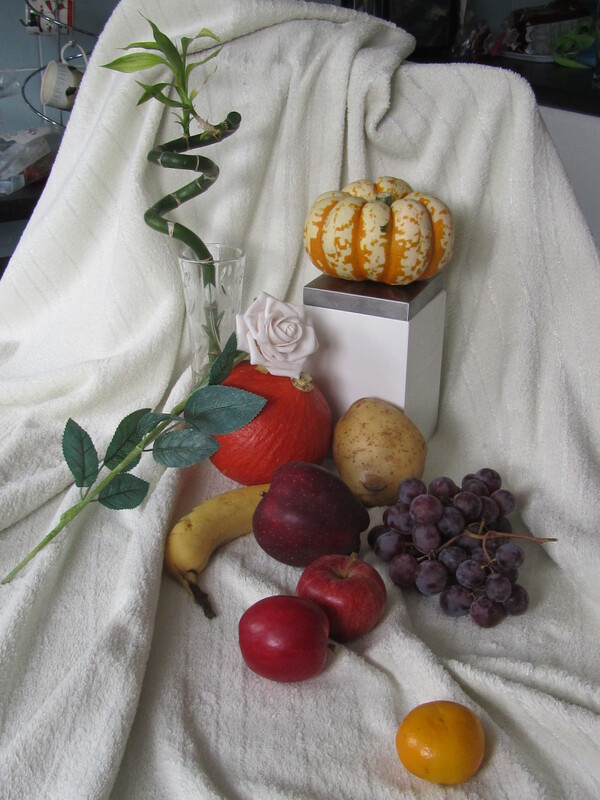 Choose at least 6 objects of different sizes and shapes to create a still life. 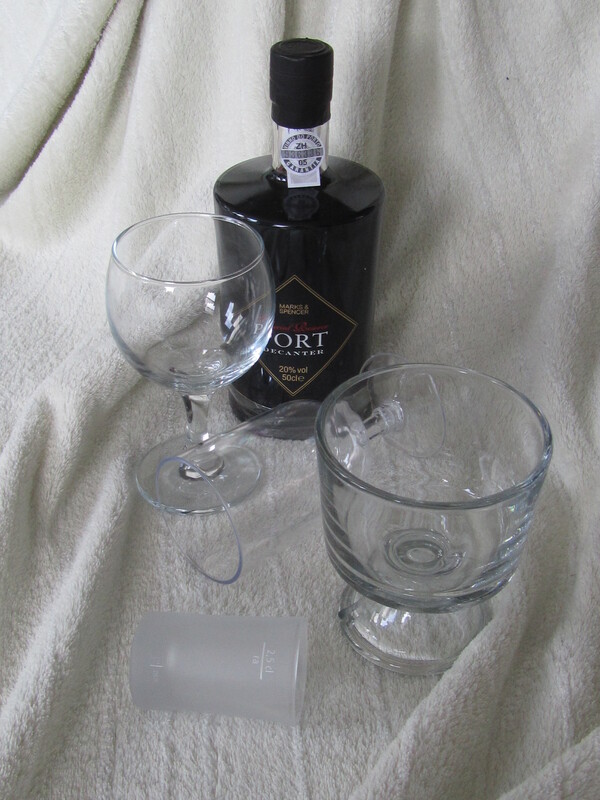 I took out some of my household things that are of the same sort then took some photos of them. I have arranged these objects in various different poses which I like to draw. 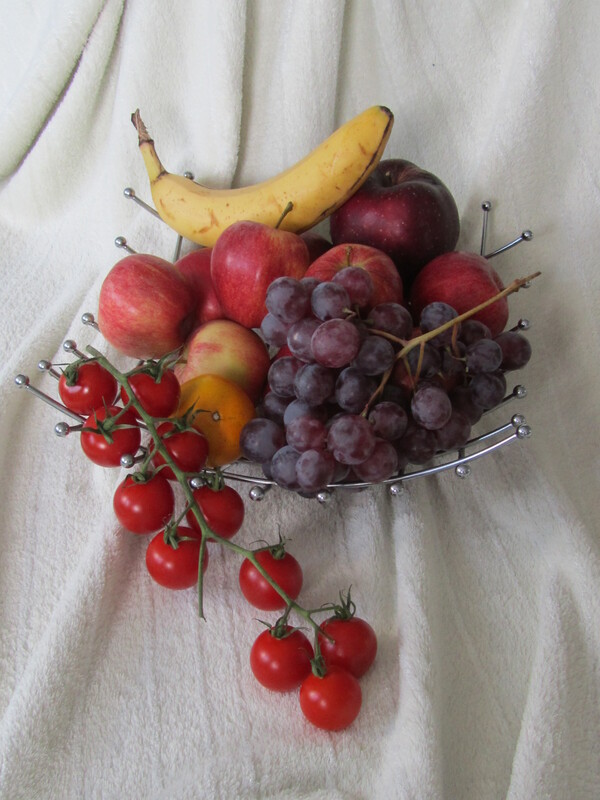 After this I have chosen some to arrange as still life. I have chosen one to draw as my still life the rest I may just sketch in my sketch book later as other still life drawings. 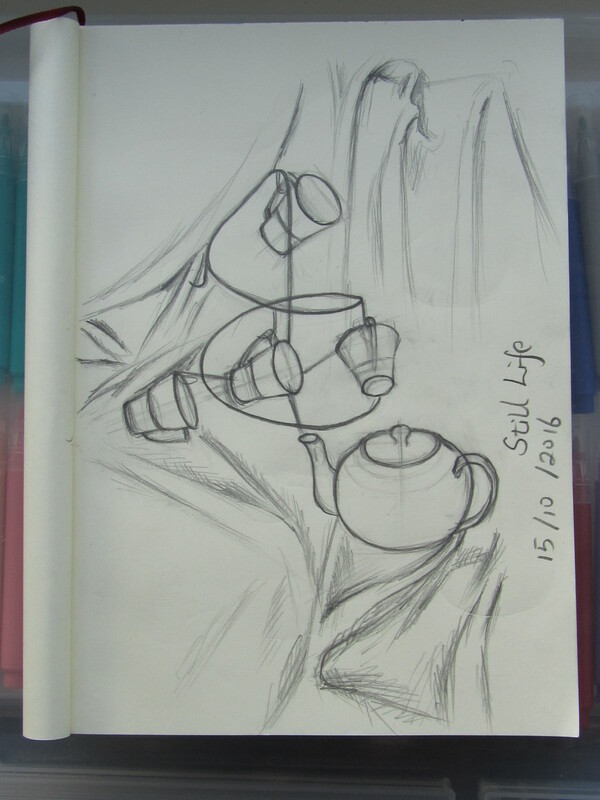 I first liked the still life which had the mug hanger and tea pot. I tried a attempt on my sketchbook. The curve of the hanger is not accurately drawn. 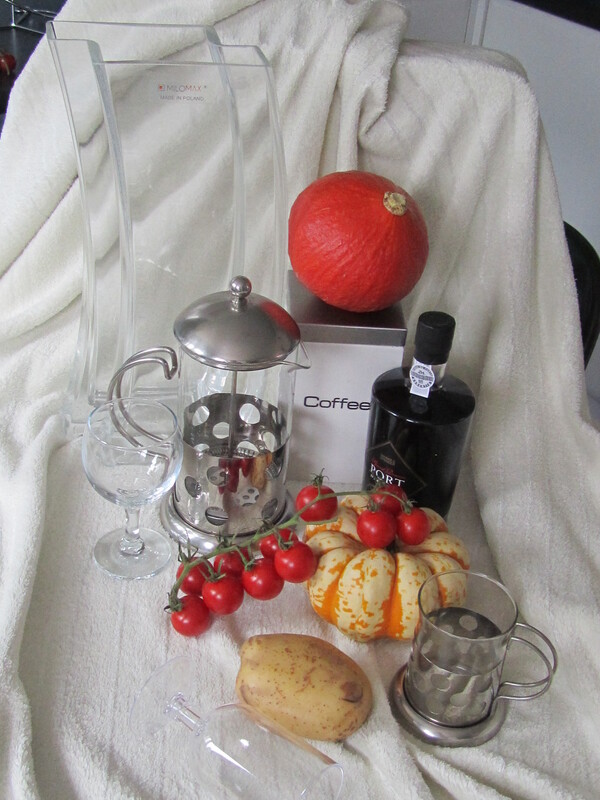 Then I have chosen the still life as below to practice as this exercise. I decided to do this because I found sketching the curves in the previous picture so difficult I decided to do a picture with more different shapes. 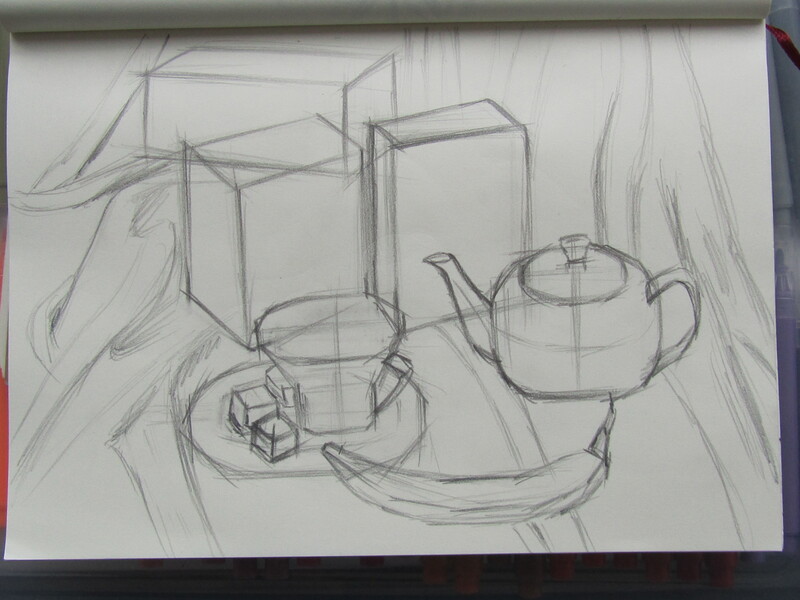 There are lots of different shapes in this picture from the banana to the teapot to the straight lines of the book and boxes. Stage 1. I used sketchbook with a 6B pencil with long lines to cross over all the objects to let myself understand where are they/how big are they and how tall/how wide/front or back to the next object. 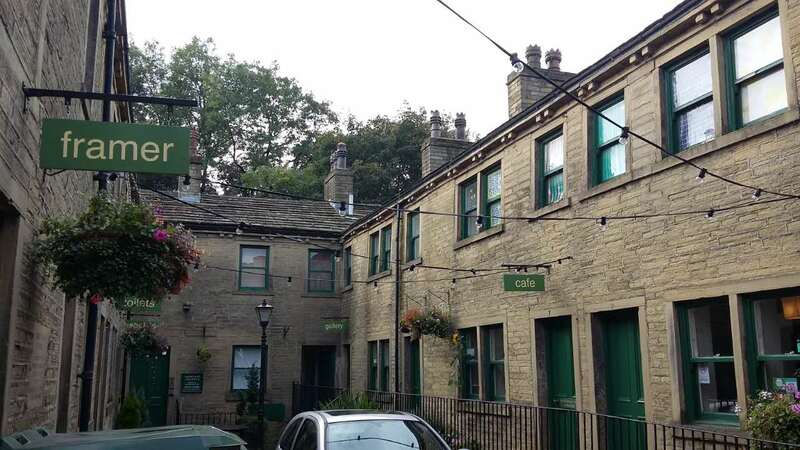 For example, the English breakfast tea box is horizontal but the Yorkshire tea box is vertical. How much wider is the top box than the bottom one? 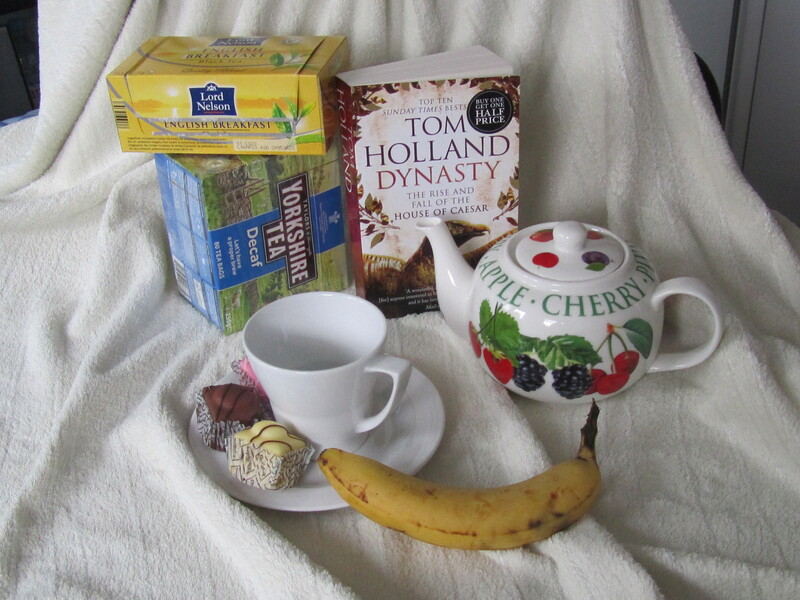 How far from the Yorkshire tea box to the book? Also where are the tea mug and tea pot and how far are they are in relation to the objections behind. When I was 19 and learning the basic sketch and I do remember the tutorial of “整体，整体，再整体” which is meaning our first thinking is “entirety, entirety and against entirety”. Step 2. After last attempt I got the memory of the objects in my mind. Then in this sketch I need to accurate relate their shapes and perspective in relation to each other. In this stage, I need to improve their shape and scaling relation. 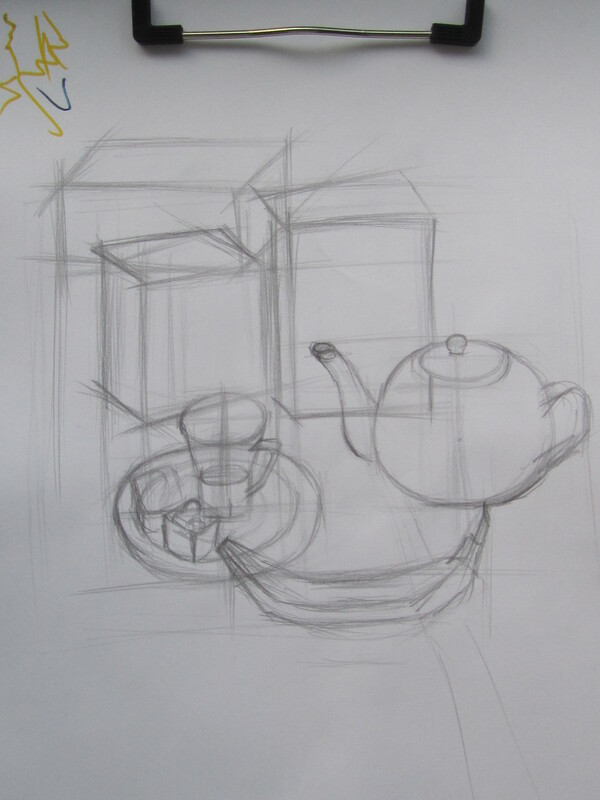 As I learnt to compare the relative sizes of the objects as I draw them, but I drew the mug bigger than it is so it is nearly the size of the tea pot. Also with the cakes the front one should be bigger than the back one. 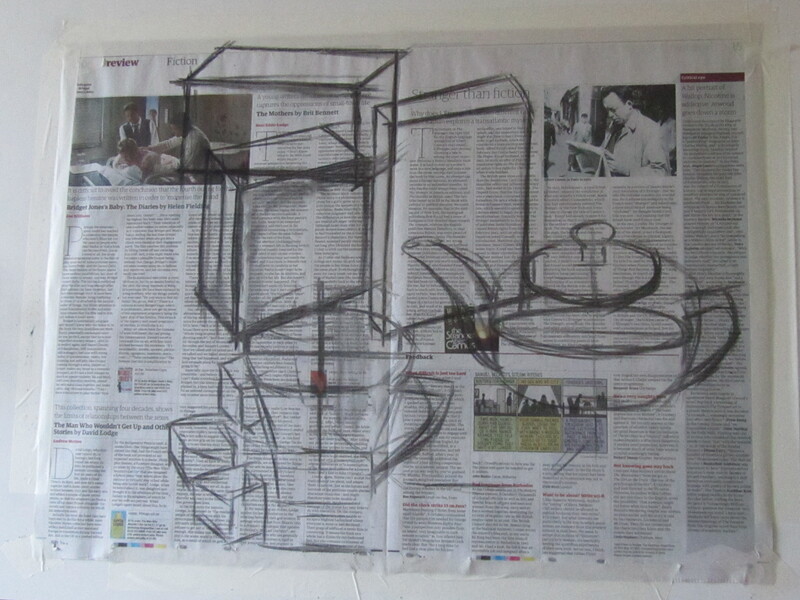 After the attempts above I am going to use charcoal to practice on a A2 size newspaper. Directly moving onto the newspaper I lost scaling relation again. The breakfast tea box is shorter than it is in reality in the picture. I could not draw the plate and the banana in this image is the main problem. At last I moved onto another legacy paper which my father in law used at in the 1960’s. It is not white and it is pale yellow but very strong and a good stuff. I have done their structure drawing. As I haven’t properly sketched in about 20 years I know I need more practice to get back my skills. 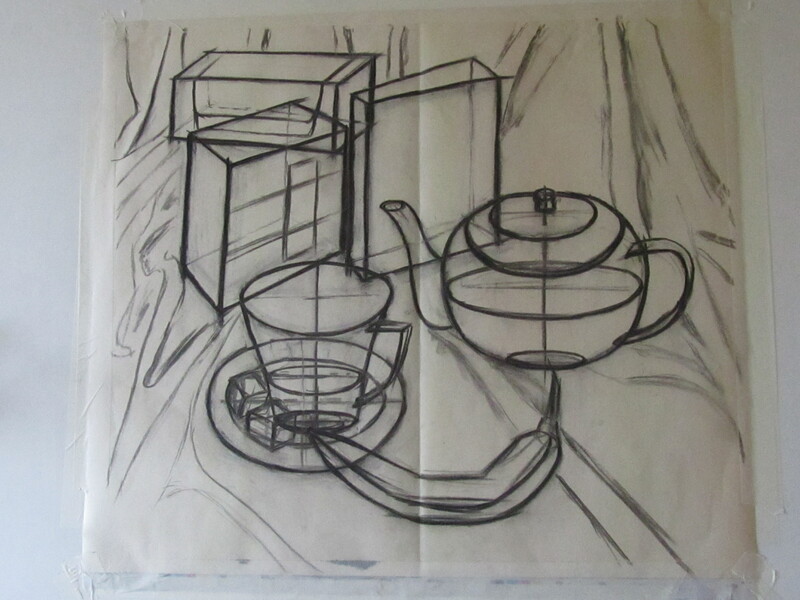 The breakfast tea box is right way in perspective but in the whole picture it has been enlarged. The Yorkshire tea box is sloping a little bit with the book. 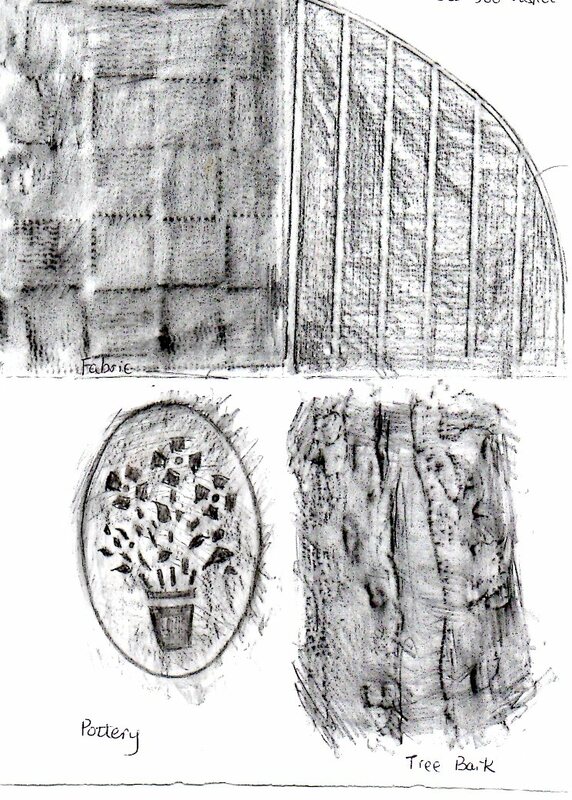 As for the overall picture, the left top of the mug should be closer to the Yorkshire tea box but I can’t draw it any bigger. 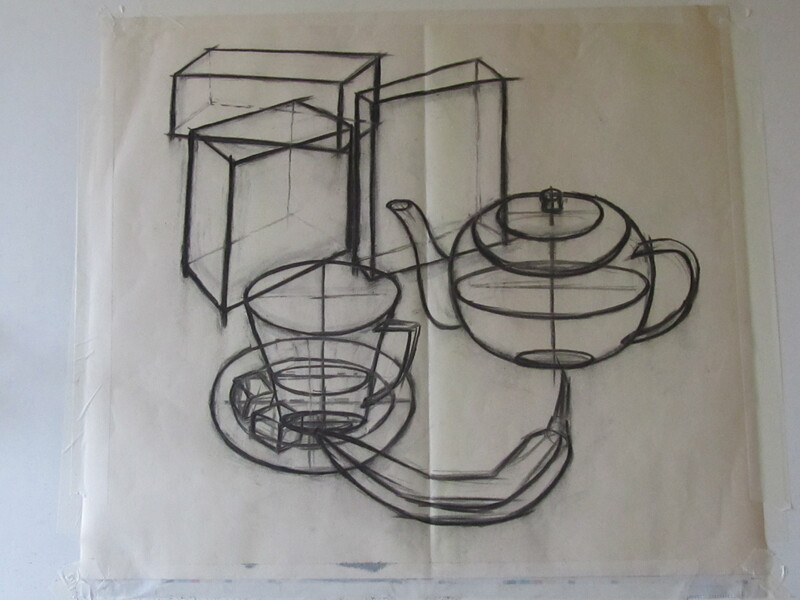 Should I draw the tea box a bit narrower? Also to match the other side the mug’s right hand side need to been swollen a bit. The plate right down in the corner need more curve on it. I try to fill out some details. The breakfast tea can open on the top and the fabric around the objects. But how can I expressive their weight? How can I show the two boxes and the book’s texture? 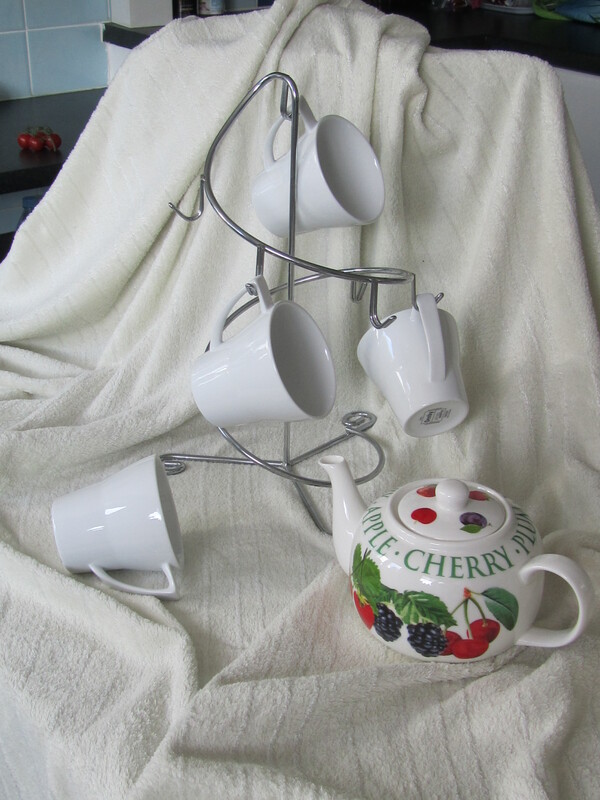 How can I show the chinaware’s shine? In next exercise I will practice the shadow and the tone. I wish I can find out some more skills to resolve the above questions. 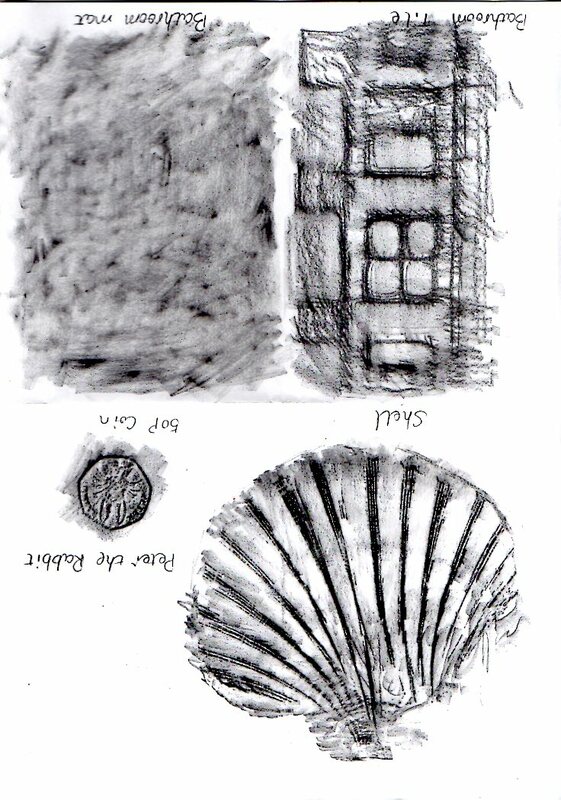 For this exercise, I need to collect a range of objects with different surface textures. I walked around my house ( I also went to the park near to my house) to find objects which have interesting surfaces, skin and textures. On my A4 sketchbook I divided a paper into 2 parts. 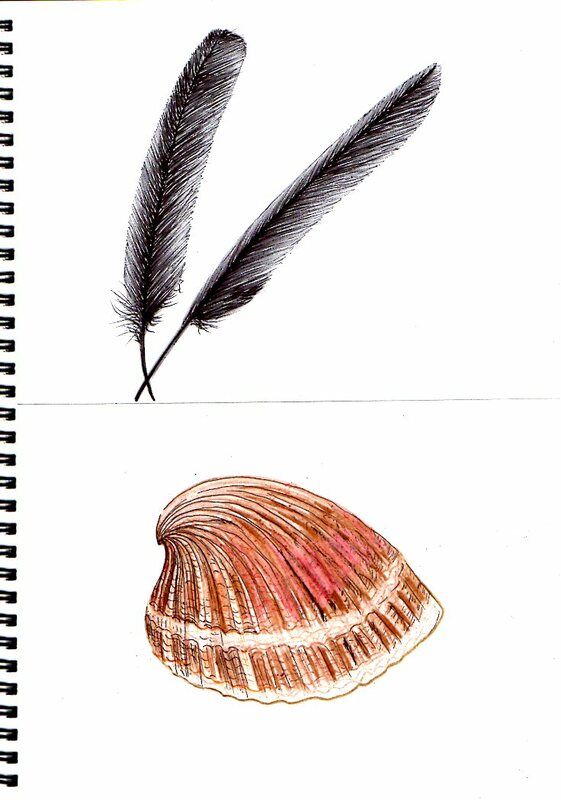 I have depicted 2 feathers and 1 shell’s texture. 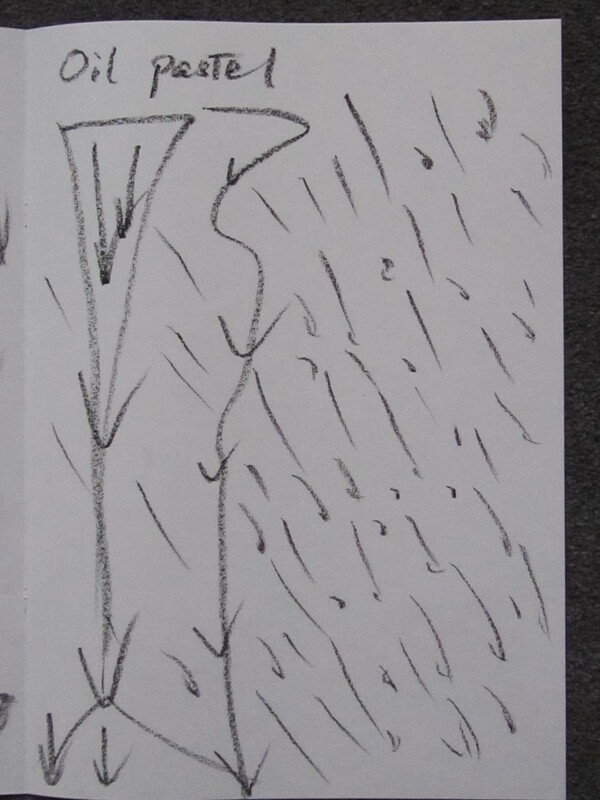 I have used a black ballpoint pen to gently draw a pigeon’s feathers. I am happy with the outcome effect which is delicate. But on the right side feather there is a dirty point with darker splodge. For the shell, It has regular growth patterns. I was at a loss as to how to draw the streaking of the shell which has so many column bars with another two white grain around them. At last it came out and looks like it is very dry and the shape is not as perfect as I would have liked. I may add another 2 bars on the top right then push them into the space so this shell shape will be better. 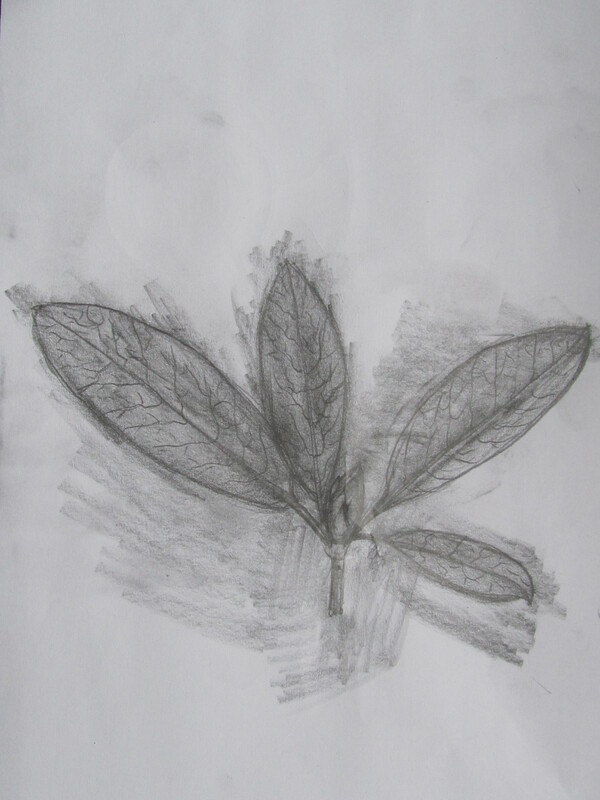 On my small sketchbook I tried a green leaf’s pattern. 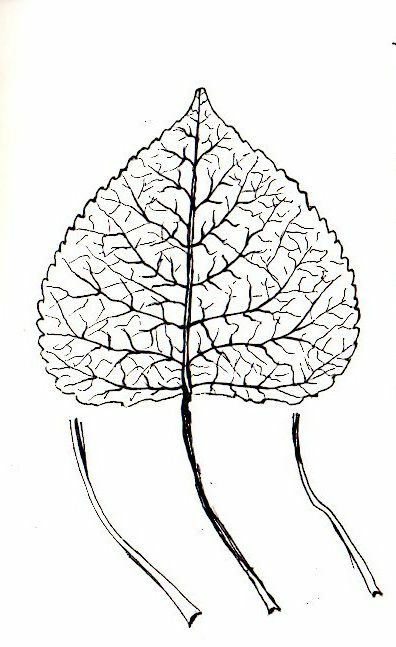 For this leaf vein I should practice drawing lines more smoothly. 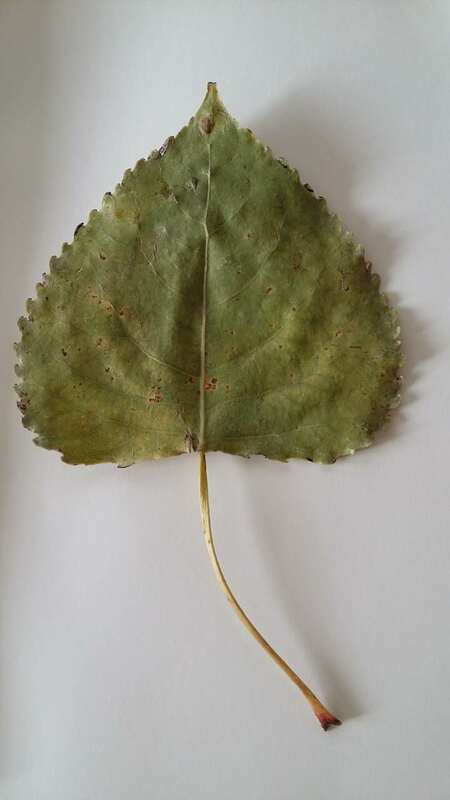 I have lost its leaf stalk for which I used the curved lines to depict it. 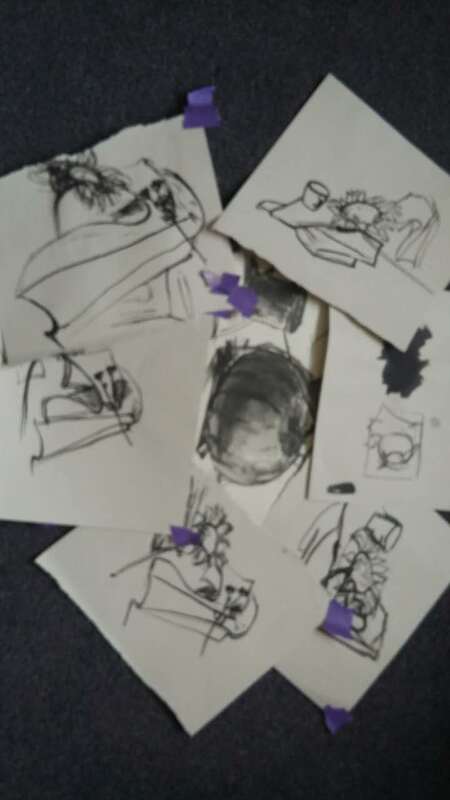 For my experiment with frottage I have chosen normal thin print paper which I think are easier to copy patterns onto than thick drawing/sketch pages. For rubbing the paper on the objects I have to complete it in one go so that there is coherence in thought and unity in style but I couldn’t keep the feathers stable also the shell’s convex curves. They mostly look good and they helped me to understand the tone and effects of their textures. The rest all have regular or independent pattern. I think if I will do again I will pay more attention and will try to make the pencils tone more regular. Now I am going to attempt the frottage, drawing and dropping colour onto image. 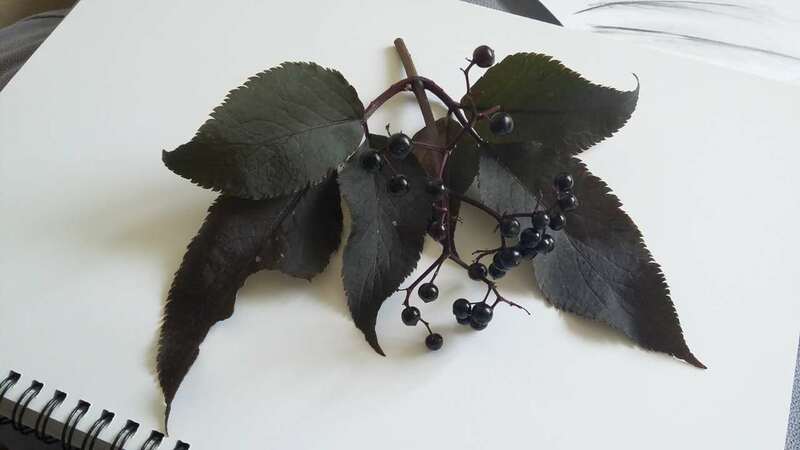 I found some plants in the garden then I have taken 2 pictures. 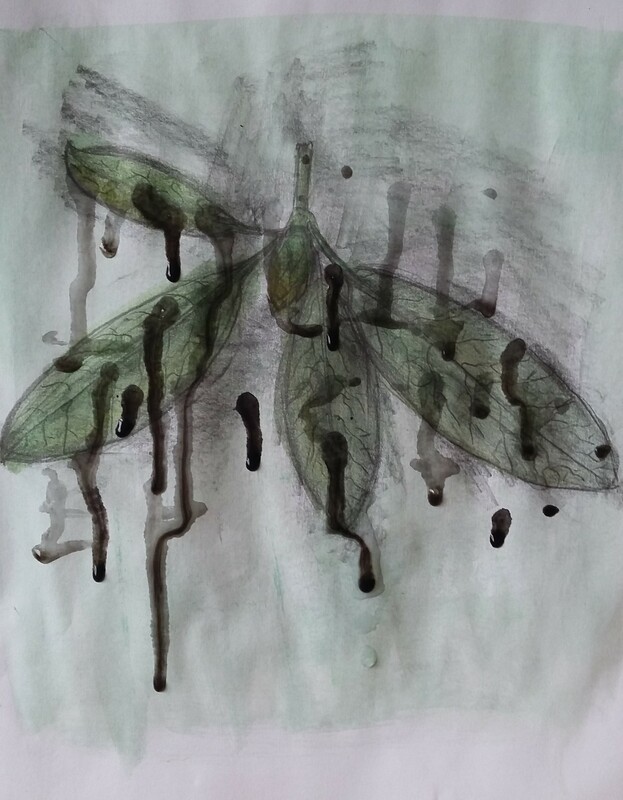 I have tried the first plant rubbed on it but unfortunately the berries’s juice soaked the paper and broke when I put the pencil onto the paper. 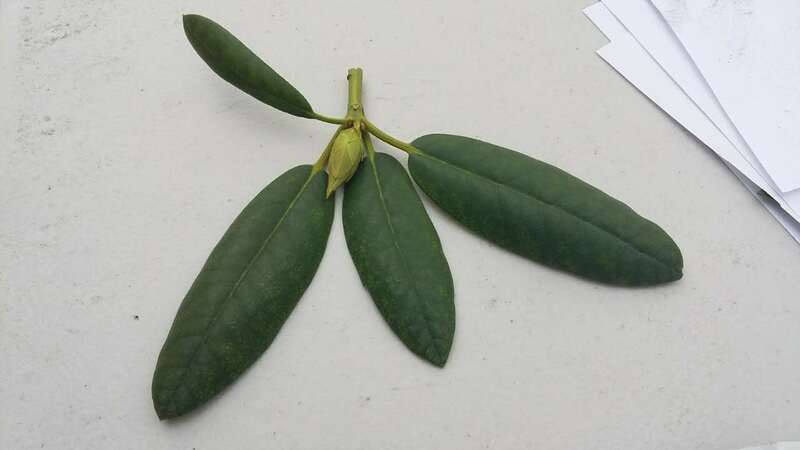 So it is a fail on this plant. 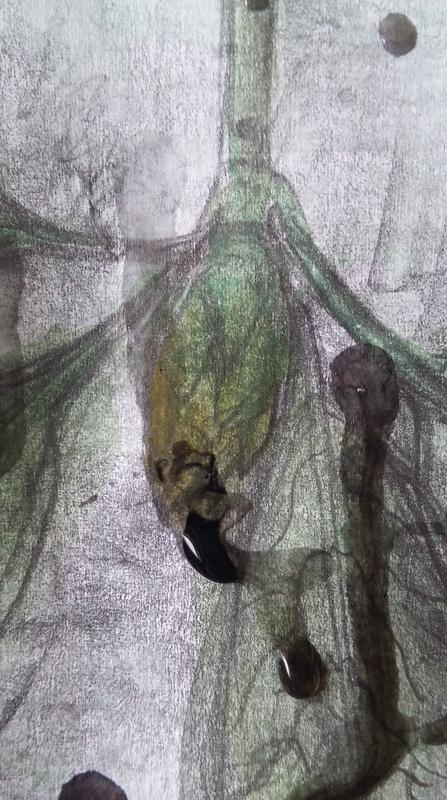 Then I put the paper on the second plant so I got the frottage also I depicted the border of the plant and at last it is as below. I brushed this image with green watercolour base as background. 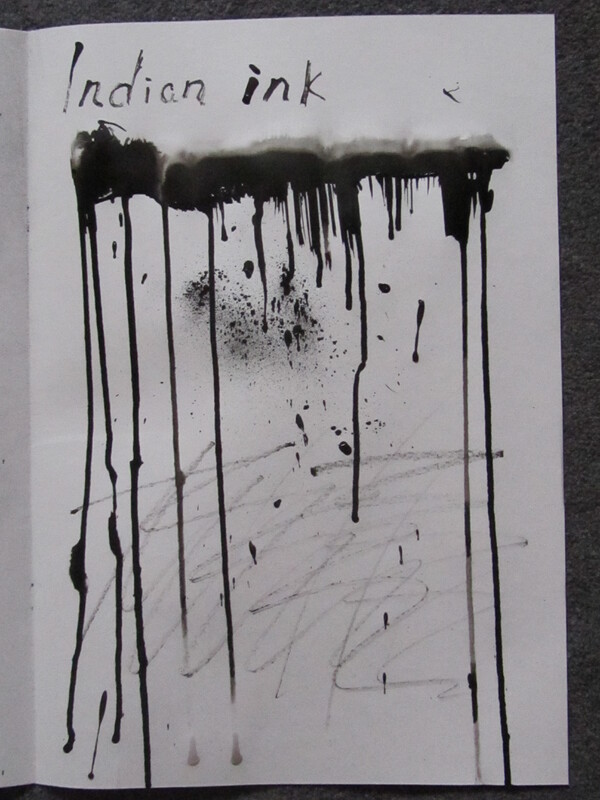 Then I started drop some black ink mixed with water. I wanted to experiment this plant as if it is raining and show the effects of the water drops. To view the whole picture it doesn’t like this plant in the rain but I have no idea how to fix it. Then I enlarge my camera’s zoom and taken more detailed photos. I don’t know how to draw things in the rain but I like the transparent stilliforms so I have a task to learn in the future. 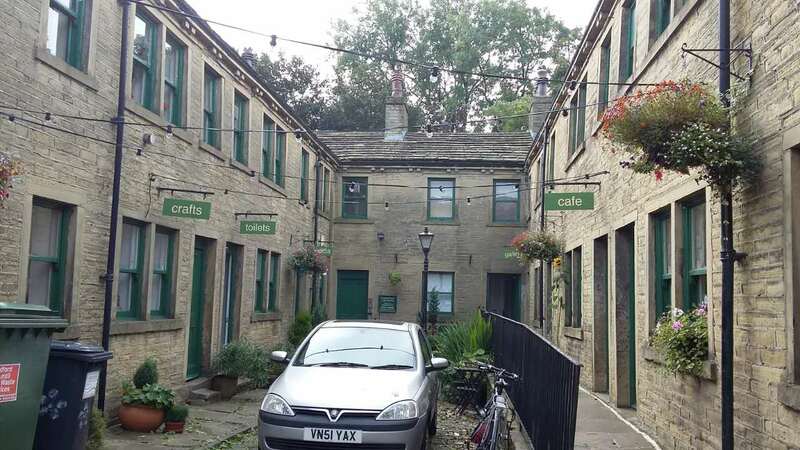 On Sat, 1st Oct, Yvonne the Curator of the South Square Centre took us to visit around the exhibition. 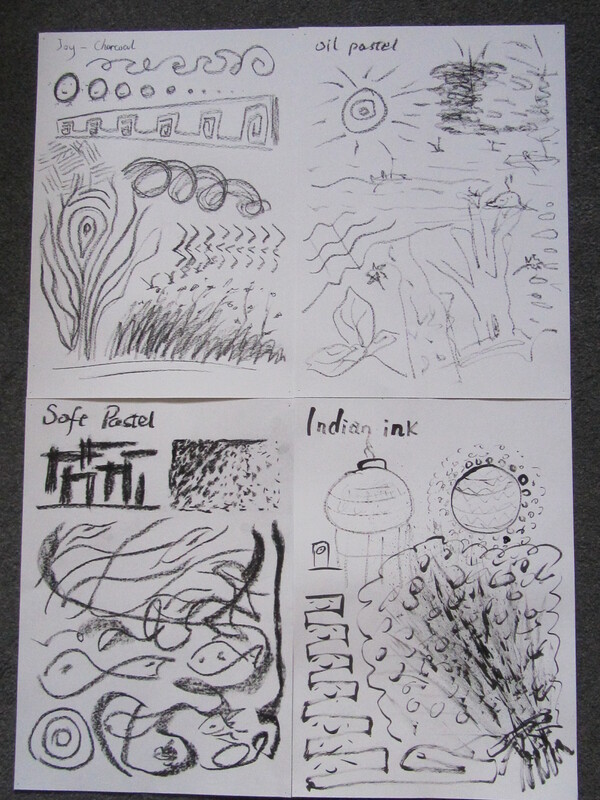 After this we got a session of drawing lessons by OCA tutor Cheryl Huntbach. Faced with drawing a big group of still life? Where are we going to start? What are we going to prepare? What are we going to do? How long does each exercise take? Etc. She also gave everyone very pertinent advice and further ideas. I did enjoy this visit and I learnt a lot from Cheryl and my other course mates. As we are doing same course and we all do distance learning, this opportunity gave me clear ideas to start drawing and to learn from other classmates. This is a fantastic start for me to learning the drawing course. I wish to join in more school visits like this. 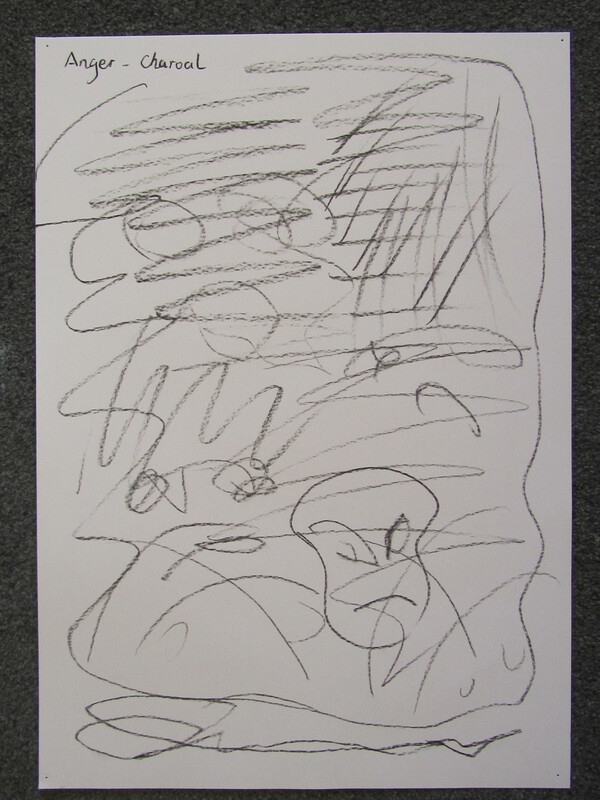 In this exercise I am going to experiment with lines and marks, through these attempts and mediums I am going to express calm, anger, joy and etc from my emotion. 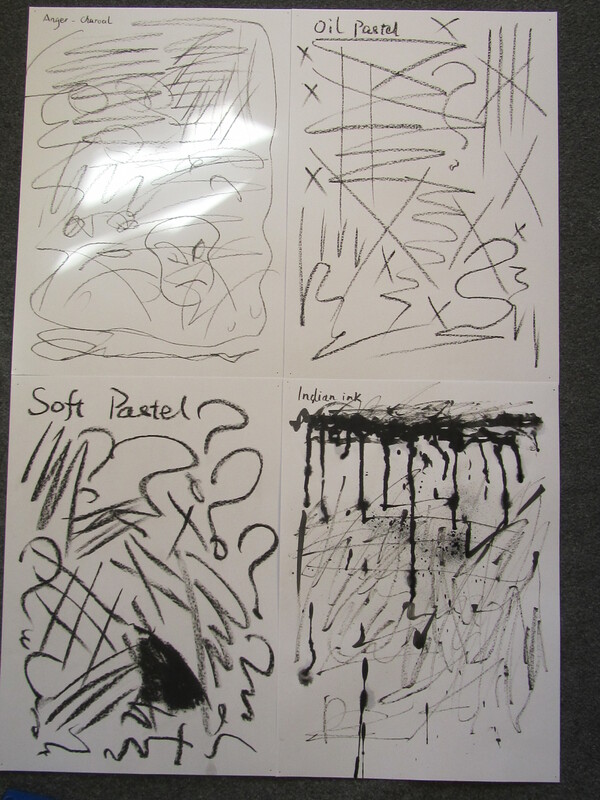 I have prepared four A1 sheets of paper, charcoal, Indian ink (with wooden stick), oil pastel and soft pastel etc. They are all black colours. Fold each sheet A1 to A2 then A3, unfold them tape them onto the board for 4 attempts. But unfortunately my A1 art board has not arrived yet. So I have to cut them to A3 to fit my current board. For the feeling of calm that I cleared all of my mind. Sit down in front of the sheets. Holding the tool gently and start to draw. I started to make lines slowly from bottom left corner using horizontal lines then vertical lines and crossed over each other in some places. I have used a triangular region to convey a stable base for this A3 area. Another triangular pattern is combined with the first one to build up a rectangle. Then I carried on to create some continuous pattern on the top. For this part I only used the line to draw so I didn’t use flowing tones. This time I started from top then going down. 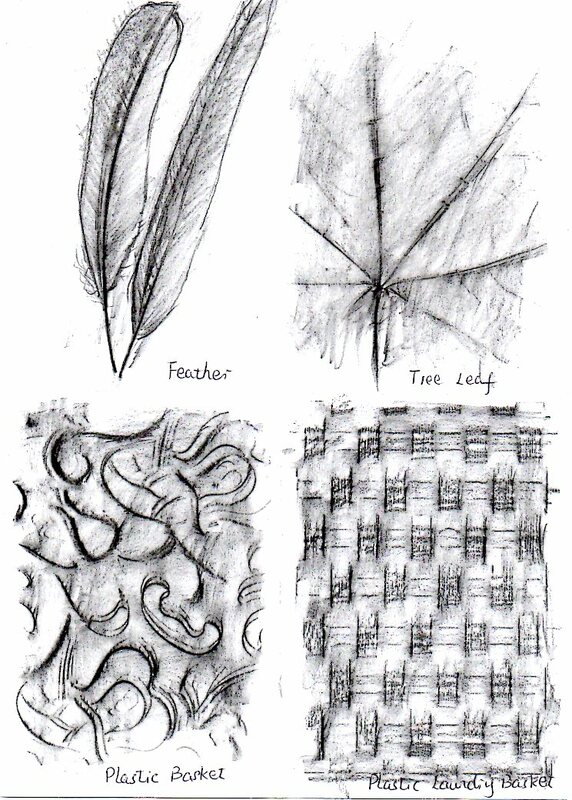 First I drew some quiet lake surface then some regular patterns. I also tried holding the pastel in different ways pressing and hard and gently. 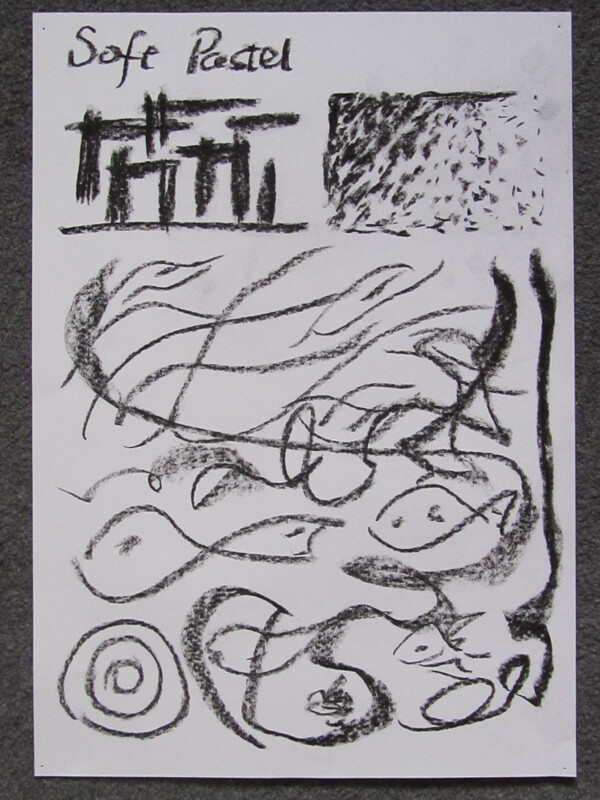 Compare the charcoal, the oil pastel is so difference it is waxy and greasy. It is more likely to stay on the paper. I started to try some rectangles in the visual space. However every stoke down is broader and darker than I had hoped so I was unhappy with the result. 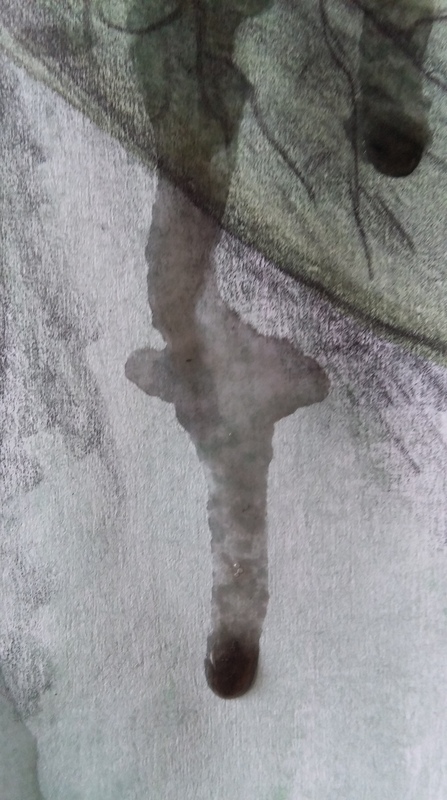 While I was drawing the powders came out and covered the whole sheet like dust and I also spotted some bits I didn’t want. The soft pastel is is most easiest colour up onto the paper but is the most unstable. For calm approach this was a failure. I got a sharpened stick to work with the ink. 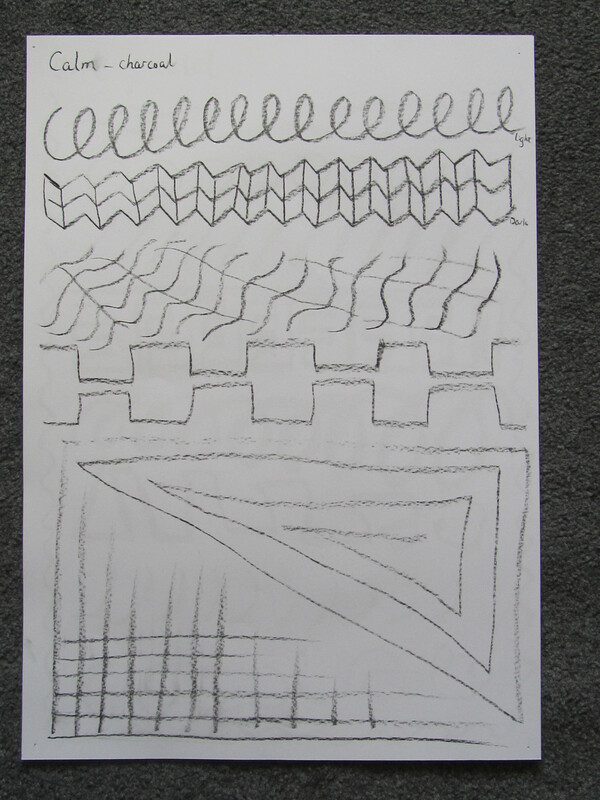 I started to use lines to draw an area as a rectangle and a ball, then random patterns on the top of sheet. Then I put the ink into an waterbrush to draw some more lines. The top bit of sheet was made with the twig. 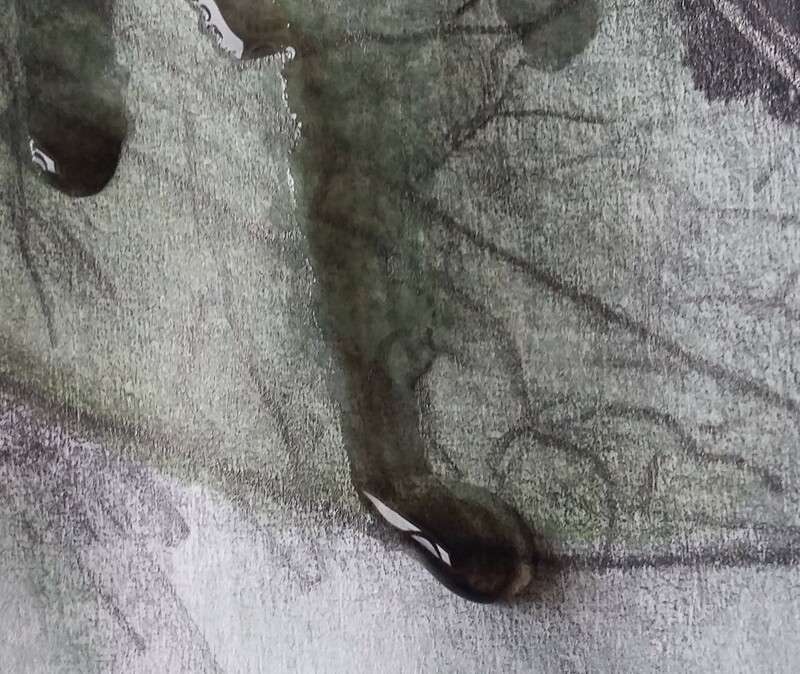 Every time the stick dip in ink then go to draw it always from dark going to light which with the ink fading as I got further along with the stroke. The bottom bit I have used the water colour brush. It is all right when I started but after a while I was getting a lot of ink coming together. The whole parts of the CALM. For the calm pieces I am trying to make the patterns regular, neat and tidy but just lost a bit control with the first soft pastel. 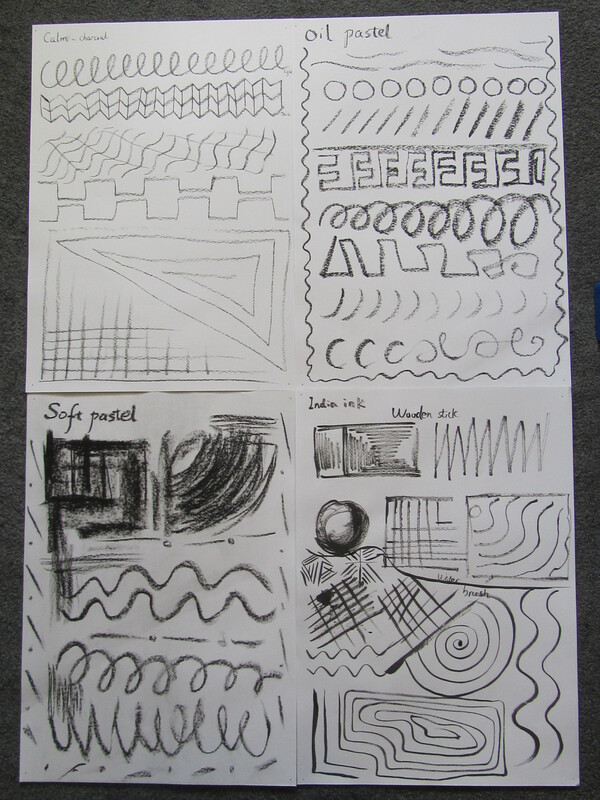 As they are all simple lines I need to practice with a wider variety of marks. 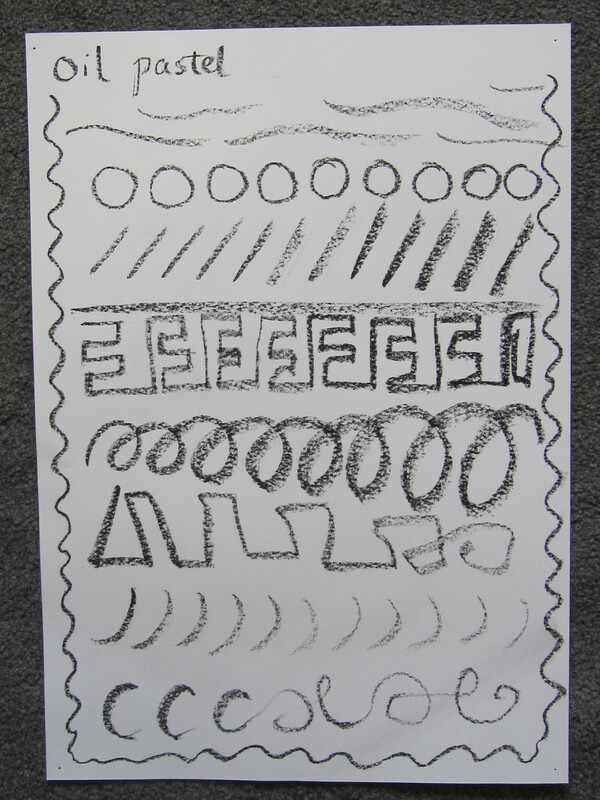 After some time spent relaxing outside I am going to try angry emotion and to make the lines and marks. ANGER – charcoal For the angry feeling I tried to bring out recently unhappy mood out. 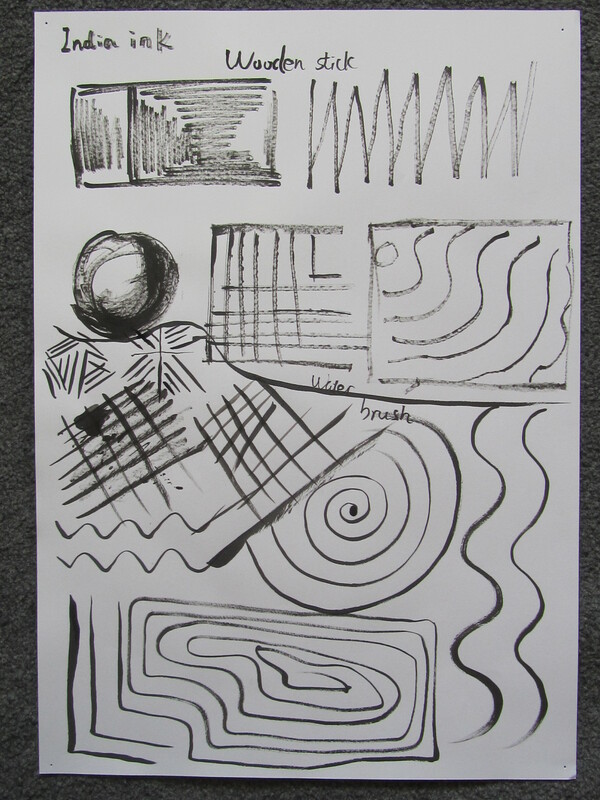 I used the fast flowing marks and lines clashing anywhere of this sheet. I put some abstract things in like the skull. I also used the flowing lines and fast drawing to finish it. I think it may need darker tones in the charcoal. ANGER – oil pastel I have used a lot of symbol “cross” to through this sheet because I am feeling anything is wrong. 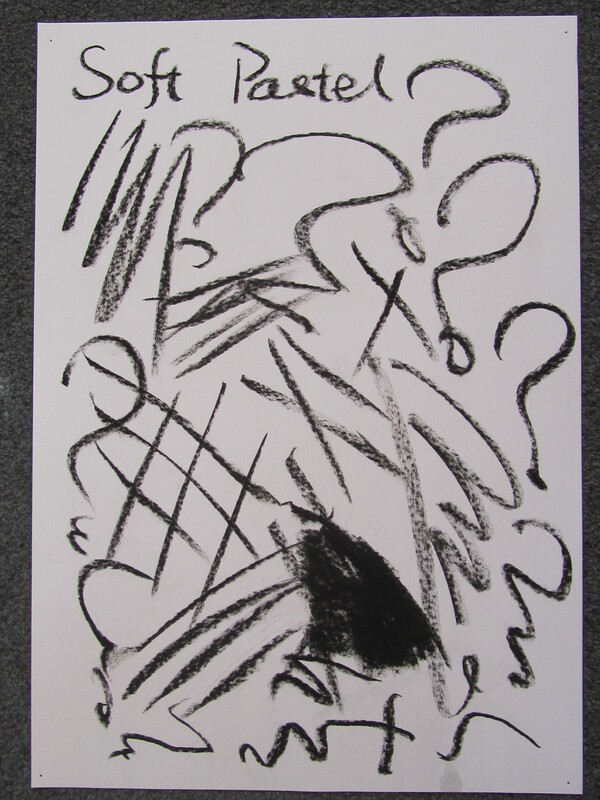 ANGER – soft pastel I have used lots of question mark “?” to convey why the things like this? why they are not going away? 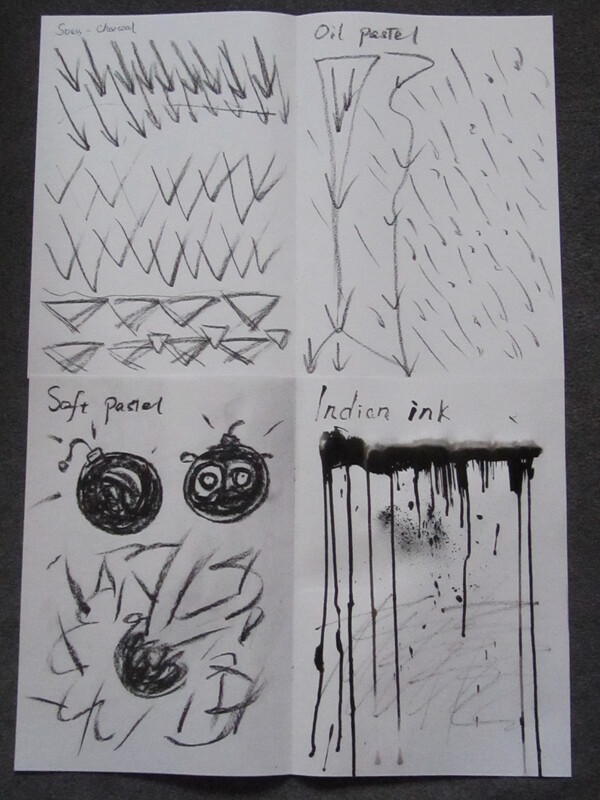 ANGER – Indian ink I tried to make some leaking effect but they are not as good as I hoped they will be. The whole parts of ANGER They are not intense enough I think. They may need to be more darker and messy, but I will leave like this then it will be easy to see the symbols in it. After a rest with some chocolate then I am trying JOY. 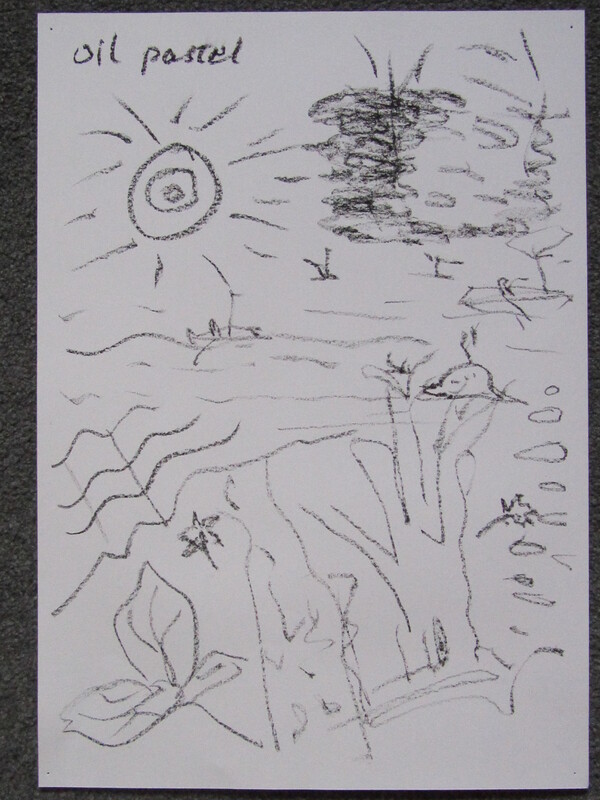 For the joyous emotion I drew a bright sun, some bushes, river with boats, birds or trees. I was thinking about putting in some more scenery but decided to leave it alone. Some happy fish are swimming. This sheet is not as neat and tidy as I would have liked and I made the top corner look a little bit like Stonehenge by accident. 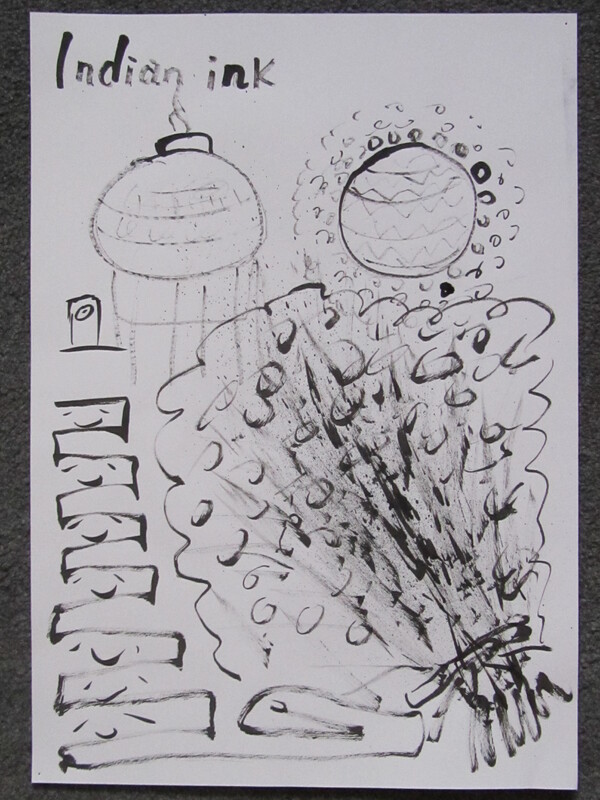 JOY – Indian ink On the top left I was drawing a festival lantern but it came out a little strange. I wanted to try some fireworks on the bottom right but I changed it to a bunch of flowers. The whole parts of JOY. These joy pieces are just exercises and I did not have a perfect plan in my mind before I start to draw. 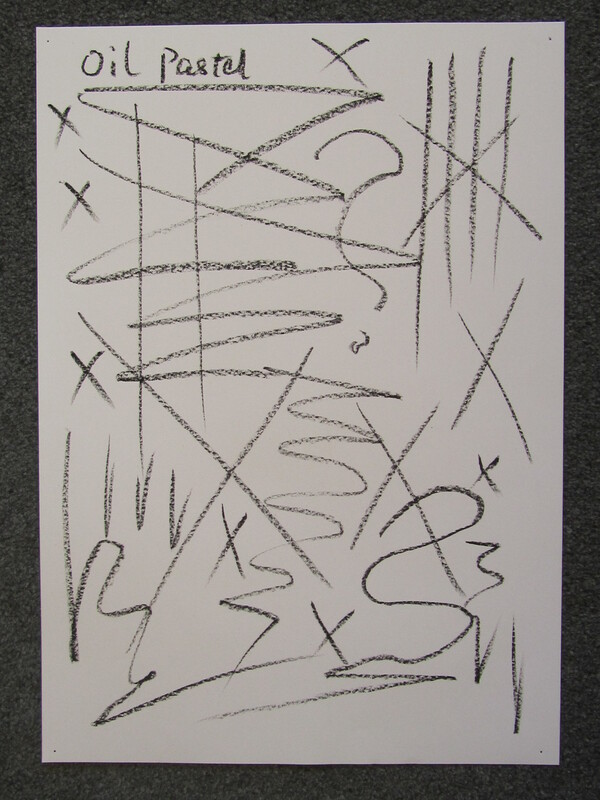 STRESS – charcoal I have used lots of arrows to point down just the stress downwards. 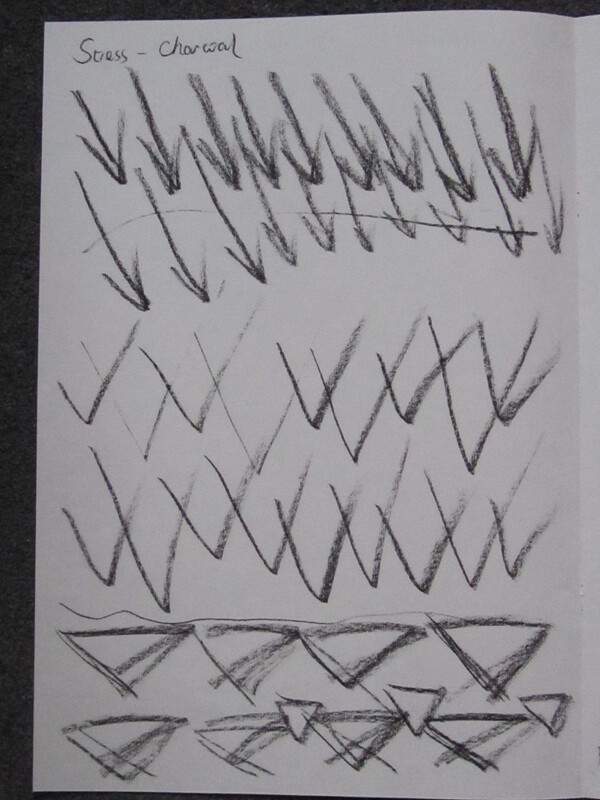 Also I drew lots of uneven triangles. 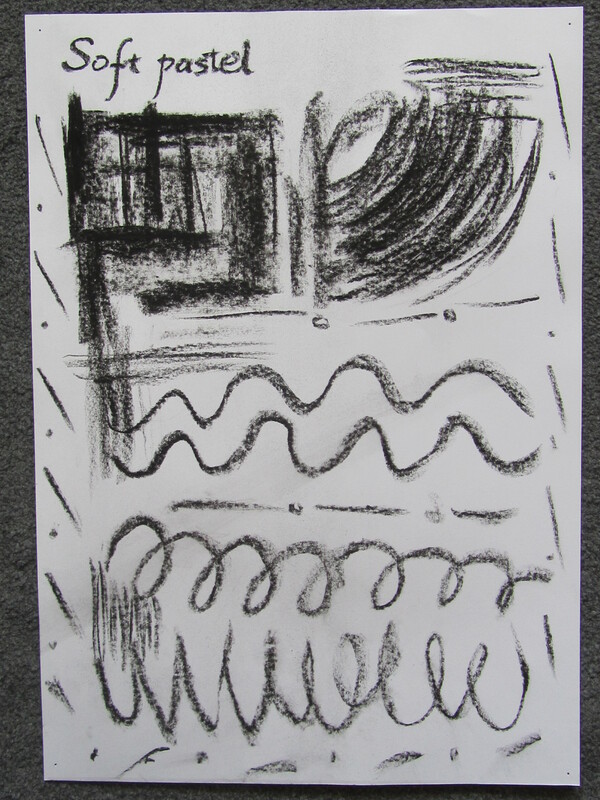 STRESS – oil pastel There are some triangles that are pointing down as well and the rain which is lashing down. 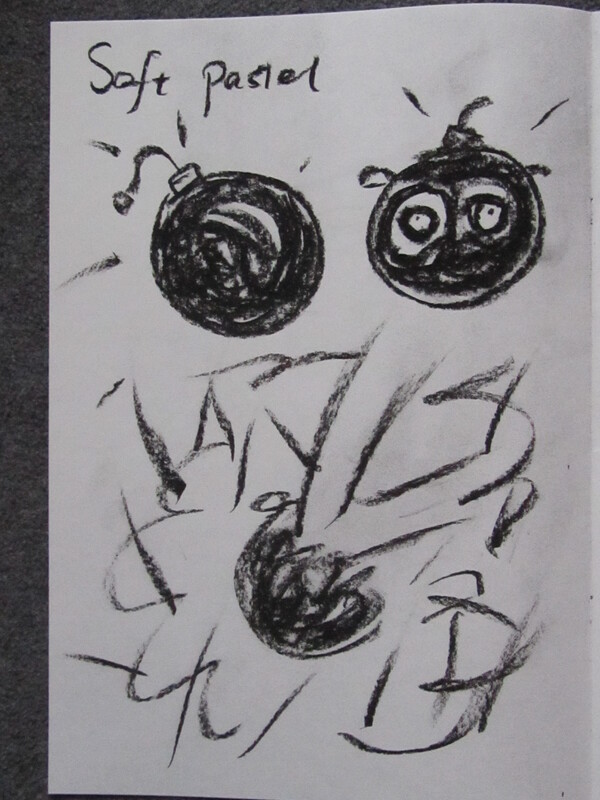 STRESS – soft pastel I shouldn’t use actual character but these three bombs just came out straight away. 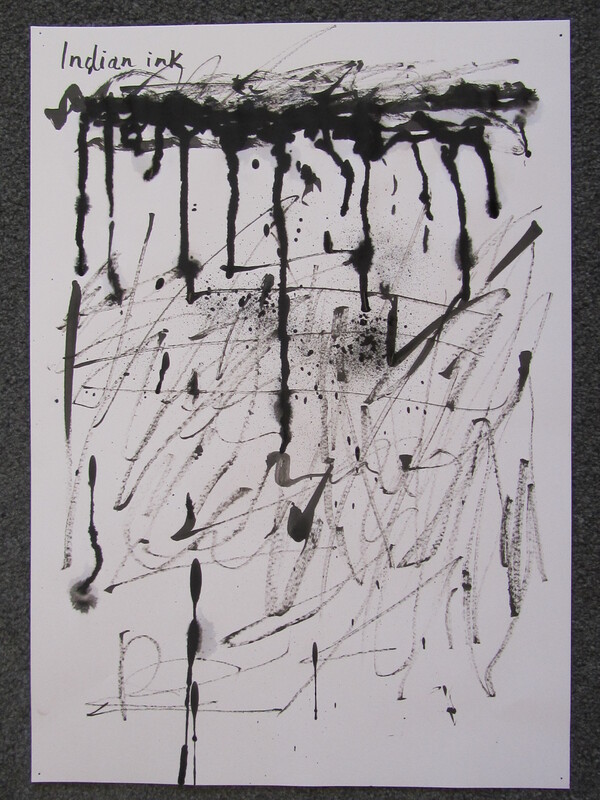 STRESS – Indian ink I have practiced the leaking effect again it is a bit better than the last one. The darkest clouds are raining down. 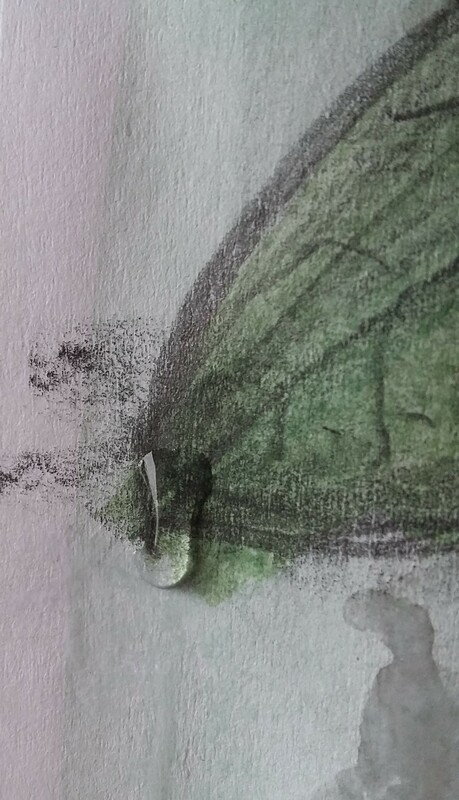 These leaking just like tears or a broken heart. The whole parts of STRESS These pieces are very rough lines and marks that just brought out the feelings straight away. If I will do this again I may to try on A4 or smaller paper then organize them on the big A1 sheet. 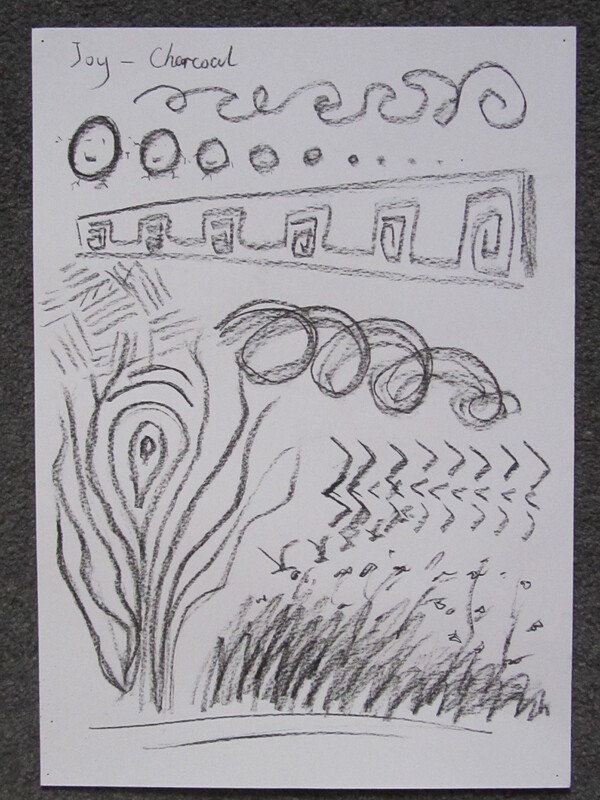 For this exercise I have learnt to use my emotion to control and convey my feeling on the image’s title. It is very difficult to convey these points just through lines and marks but it is in the detail and the style that the effects come through. As I learn from the work and I can pay more attention to other artists they approach they have used. Then I can improve my drawing. For the tools I didn’t really use Indian ink and oil pastel before, but even this is first time I did enjoy them. For the future in the drawing course I will take these points into the drawing process. What the characters and elements convey and how my lines and marks follow them?